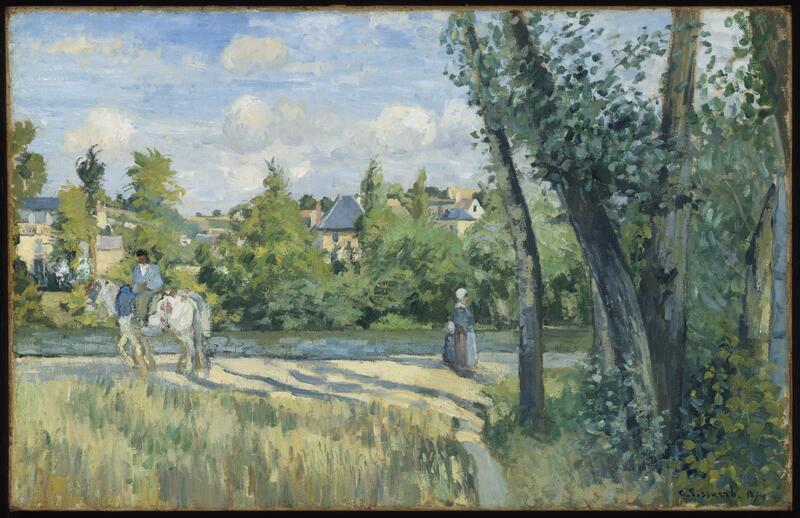 During the 1870s, many of the Impressionist landscape painters went to live in the small towns surrounding Paris. They painted the ordinary scenes of the nearby countryside with a fresh, direct approach, often working outdoors. The balanced composition and cool harmony of blues, greens, and creamy yellow give this river view a serene stability typical of the work of Pissarro, a leader in the group and an important mentor to Cézanne and Gauguin. According to Lodovic Rodo Pissarro and Lionello Venturi, "Camille Pissarro, son art - son oeuvre" (Paris, 1939, vol. 1, cat. no. 255, p. 115), the painting was in the Faure collection and a note in the MFA curatorial file indicates that Faure's name can be found "written rather indistinctly" on the reverse of the painting stretcher. According to additional notes in the MFA curatorial file, Herbert Elfers of Durand-Ruel, New York, told Charles C. Cunningham of the MFA that Durand-Ruel probably bought the painting from the Faure collection. However, the gallery was unable to provide verification of this, stating only that the New York branch had acquired it from the Paris branch in 1919.